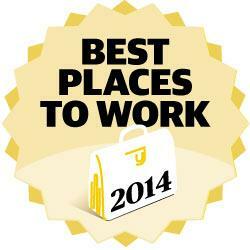 integrateIT named to Best Places to Work list again in 2014! "We are very excited to be recognized once again as a great place to work by the Washington Business Journal. This company is all about the people that work for it and so an award like this means a great deal to us. " Annandale, VA – March 27, 2014 – The Washington Business Journal has again named integrateIT, LLC as one of the Best Places To Work in Greater Washington in 2014. This is the second year in a row that integrateIT, LLC has received this award. Best Places to Work is designed to honor the area’s leading employers. They look for companies that go beyond the norm to foster an enjoyable and meaningful work environment for their employees. The Washington Business Journal recognized the winners and plan to announce the individual category winners at an awards event in Tysons Corner in May. Companies will also be profiled in the Washington Business Journal. integrateIT LLC was first selected to the Best Places to Work in Washington list in 2013.